Note: These are two separate books, Blackout and All Clear, but they form one single story in two volumes. There is no attempt to wrap up the story in Blackout in any way – it simply ends with a note that the story will continue in All Clear. So I was very glad that it didn’t take long for the library to get in the second book so I could continue with the story. I had enjoyed Connie Willis’ previous book involving time travel, Doomsday Book, so I was eager to read more. (As a matter of fact, I had read Doomsday Book in part because I knew there were later books on time travel and I prefer to read books in order.) Blackout and All Clear were published almost twenty years after Doomsday Book, and while a few of the same characters appear, it’s clear that Willis’ writing – while good in the earlier book – has definitely grown and deepened over the years. A few months ago, I read an article about “How to Tell Time in Heaven.” Wait a minute, I thought. Time in heaven? I thought heaven existed outside of time. Not that I had really ever thought about it much, that I can remember. I had a philosophy professor in college (a Baptist liberal arts college where the Christian faith was a part of every field of study) who challenged some notions people commonly have about heaven, even among Bible-believing churches. For instance, it is a common idea in our society that dead people become angels. I grew up reading The Littlest Angel (still one of my favorite Christmas-themed stories), and while I knew it was fiction, I guess I more or less accepted its premise of a human boy becoming an angel. Then in high school, our youth group at the Baptist church did a study on angelology, a branch of theology I hadn’t even known existed. (Not that I knew much about theology in high school, but I was an avid reader of Christian books, both fiction and non-fiction.) Scripture gives little information about angels, but it certainly never suggest that any of them were once human beings. But most churchgoers don’t study angelogy, much less people who have no use for organized religion (though they may still believe in angels). So the idea of people becoming angels persists, helped along, no doubt, by various movies (two I can think of offhand are It’s a Wonderful Life and The Heavenly Kid, and I’m sure there are several I haven’t even seen). Another common idea my professor challenged is thinking of heaven as some ethereal region for disembodied spirits, while the Bible talks about resurrected bodies on a new Earth. He also challenged the belief common among Christians that our souls are eternal by their nature, explaining to us that we will remain created beings, and the eternity of our lives will still be, on and on throughout eternity, a gift of God. What I don’t remember is any discussion of time versus timelessness in that regard. What I do remember, from attending churches throughout my life, is singing hymns such as “When the Roll Is Called Up Yonder” that state that “time will be no more.” Discussions of whether a believer goes to heaven immediately upon death (as opposed to “soul sleep”) also assume the idea of timelessness in heaven. Michael Patton discusses this concept in his Parchment & Pen blog, in a post from 2009 that I apparently missed. As he explains, and as I read elsewhere when I started thinking about this, the verse in Revelation that says “time will be no more” would be more accurately translated “there will be no more delay” before certain end-times events take place. Some of the articles and blog posts I found on this subject state that there must be time in heaven because the nature of life – even eternal life – requires it. Thinking, talking, and acting all involve a succession of thoughts, words, and actions, and for one thing to come after another there must be passage of time. One of these discussions points out that time is an essential element of music, which is generally agreed to have a prominent role in heaven. Now, it doesn’t bother me to be told that heaven is different from how people, including many Christians, commonly think of it. The Bible gives very little in the way of direct description of heaven. Much that Scripture does say about heaven is in the form of visions, and it is hardly surprising that such visions would make heavy use of symbolic language to try to convey experiences and ideas that go beyond the limits of earthly human understanding. In some ways, speculation about the details of heaven is pointless. We neither can know nor need to know now the particulars of our future existence. For the most part I see the entire topic as something God will take care of and I’ll find out when I need to. It’s fun to imagine huge libraries in heaven where I can read as much as I want to, but even if books don’t exist in heaven (which I find highly doubtful considering that God used Scripture to reveal Himself to us), I am sure I will not be bored. I don’t think we’ll sit around all day playing harps, but I would be happy to be able to play the harp. Would I just instantly find myself able to play, however, or would I have to learn? Learning implies change and change implies time. God made us humans naturally curious and eager to learn new things, and it seems strange to think that trait would be gone in heaven. I love the idea of learning for eternity. What about other kinds of personal development? For years I attended churches where it was assumed that whatever level of spiritual maturity one had reached upon death, that was the level one would be at for eternity. I suppose this teaching (not generally stated explicitly but I think it was occasionally) was based on the idea of timelessness in heaven, and it was used as a means of motivating people to pursue spiritual growth so they wouldn’t be stuck at some low level of spirituality forever. After all, if you could be certain not only of being saved but of gaining the highest level of spirituality immediately upon death, why would one work hard at spiritual growth in this life? If there is time of some kind in heaven, however, then there would seem to be the opportunity not only to learn more about God’s creation and to create (books, songs, works of art), but also to continue to grow in one’s relationship with God. What there won’t be is the sense of time as a burden, either having too much to do before a looming deadline, or having too much time and too little that is meaningful to fill the empty hours. My husband, in a recent sermon on the eternal nature of God, talked about a kind of “timeless time” that we spend worshiping God – not just someday in heaven but here and now. Time can be meaningless, he said, when we are in the presence of God. It’s hardly that time ceases to exist, merely that it does not constrain us. And that is the kind of time that I suppose we will experience in heaven – or on the new Earth, to be precise, but “in heaven” in that we will be in the eternal presence of God. This morning in (adult) Sunday School, someone asked me to clarify the sequence of events from the evening of the Last Supper to the resurrection. I know that not everyone agrees with the traditional view that Jesus was betrayed on Thursday evening and rose early Sunday morning. But disputes over the timeline were not pertinent to the lesson (and I’m not the teacher, though as pastor’s wife I am frequently asked questions not covered in the quarterly), so I explained briefly that what I set forth was the traditional view. I remember from Bible school that some people think Jesus died on a Wednesday, in order to have him in the tomb for “three days and three nights.” From what I have read, however, I am inclined toward the traditional view that he died on a Friday. (Not that I think it is an essential matter. Why he died is far more important.) What I did not realize until I did some web surfing today, however, is that not everyone agrees that he rose from the dead on Sunday. For Toastmasters this evening, members had been invited to bring stories, jokes, etc. related to St. Patrick’s Day or Ireland in general. Pam, the director of the library where our club meets, brought in this unusually decorated cake. Leprechaun traps, she explained, can take any number of forms. 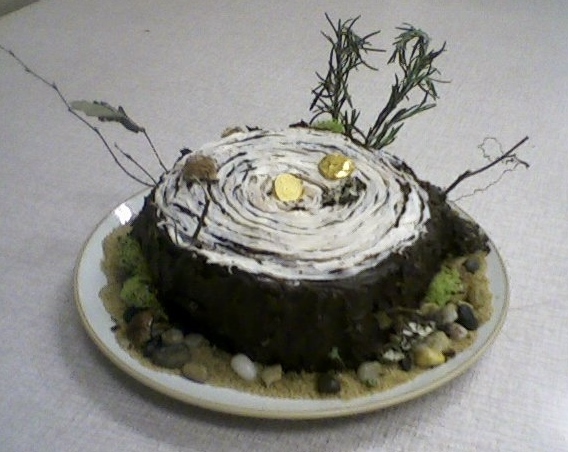 Hers is a cake decorated to look like a tree stump, with a hidden hole in the middle for the leprechaun to fall into when he follows the trail of the gold coins. Leprechaun traps can be virtual too – i.e. computer programs. I’m sure Al would like it if I could create a computer game to trap a leprechaun, but my programming skills do not include the expertise in graphics that are integral to today’s computer games. I enjoy looking at some of the ideas other people have come up with, though. Another cute cake idea – similar in concept but quite different in appearance – has a rainbow hidden inside. I suppose someday I’ll probably have grandchildren. Maybe one of them will inherit my love of crafts and want to trap leprechauns with me. I was driving home from work a day or two ago, and I noticed the newly risen moon in my rear-view mirror. I was trying to decide how close it was to being full, and also trying to stop paying attention to the (beautiful) moon in my mirror and look at the (boring) traffic on the highway in front of me. I’m used to enjoying the beauty of the sunset during my drive home (only during some times of year, of course), but I don’t often see the moon rising. For a moment it threw me that I was seeing it, then I reminded myself that I was driving west but seeing the eastern sky in my rearview mirror. That got me thinking about how to figure out when to look for the moon and where in the sky, and about the phases of the moon in general. I have a fairly long commute (at least forty-five to fifty minutes, depending on traffic), so I had plenty of time trying to construct diagrams in my head. I understand how the different phases work in terms of the relative positions of earth, moon, and sun, in terms of how much and which part of the moon is illuminated, but I never remember how to factor in time of day. And the one thing I just couldn’t make sense of, in my mental diagrams, was the new moon.